It has been a rapid two and a half months since I discovered Norway’s SÂVER, by means of the stunning official video for the their song “I, Vanish“. From that very first time experiencing the song and its engrossing imagery, I was instantaneously hooked… plugged in to a feeling that something unique was taking place. See, that can be a hard acquisition sometimes, to hear music that is so engrossing, so fantastic that it causes you to feel something on a large-scale. Yet, SÂVER did exactly this, and guess what? They did not stop there, as the following month they delivered a second salvo of sonic excess by way of a stark ocular presentation for another song, the hauntingly harrowing “Dissolve To Ashes“. Two tremendous compositions that seemed to possess the ability to shudder the very earth beneath our feet? I knew that I had to have more and as sure as most demons are summoned by the calling of their names, there was indeed more to come. 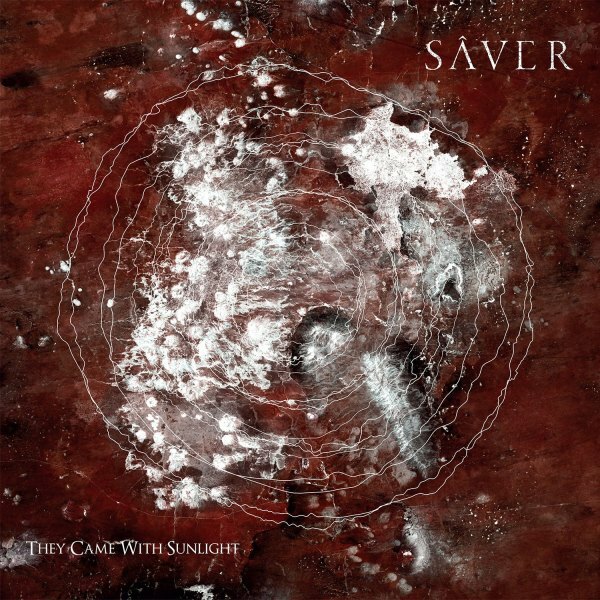 ‘They Came With Sunlight‘, the monumental, full-length début from SÂVER was released from Pelagic Records in early March and there’s no sense in mincing words. This is one unholy, monstrous beast of an album… a proper introduction made with aplomb so abominable it has the potential to scar you for life. Though a newer band this may be, make no mistake that this artistic trio – Ole Christian Helstad (bass, vocals), Ole Ulvik Rokseth (guitar, synth, vocals), and Markus Støle (drums) – seem to be old souls with the abilities to tap into something altogether unearthly in their music. With their shared collective past in bands Tombstone and Hymn, this trio are no strangers to heaviness nor do they forego their roots on this album. You won’t know that initially, of course, at least not for the first two minutes or so, as the audible invitation of “Distant Path” is extended. Like any good two-minute warning, what unfurls from that point forward is a bludgeoning movement heaving with lethal, crippling sludge metal. It soon achieves a maximum velocity, then levels out amid deluging waves of apocalyptic doom – vocals and music melding into a rhythmic cadence as a cacophonic maelström rages. Without missing a beat, the infectious churning riff of “I, Vanish” invades, then navigates its way into your brain like a burrowing earworm. A bit Voivod-ian in feel, the music encircles the listener in a swirling, syncopated vortex of that addictive riff, crunching rhythms, and kit-battering drums. Before too long, hellish, black metal type vocals find their away into things, just prior to some flourishes of psychedelia in the music that precede slight, periodic melodic turns. A lot of this album appears to be an exploration in the juxtaposition of contrasting elements – heavy as opposed to airy, or chaotic versus orderly, aggression or tranquility. Sometimes, these opposing ends of the sonic spectrum are manipulated to face off within a singular track; other times a particular song embodies one, while an altogether different song represents another. Perhaps the best representation for the second principle of my theory are “Influx” and “How They Envisioned Life“. The first provides a slightly unsettling immersion into a barren cosmic void, one achieved via minimal engagements of instrumentation. Devoid of any vocals, there is a feeling of untethered drifting that slowly engulfs you. Like some celestial Venus Flytrap, it enthralls you right up until your destruction. That undoing does not last though, for a symbolic reconstitution occurs with the slow-oozing, thunderously pummeling arrival of “How They Envisioned Life“. Bordering on the cusp of drone type doom, this ruining juggernaut heaps burdensome distributions of aural weight upon a body, pound after pound. Gradually gaining more and more mass as it pulverizes your being, the eventual imparting of vocalizations come by way of two means – volatile and acidic throated, or harsh, but slightly cleaner and shouted ones (reminiscent of Neurosis’ Steve Von Till). At this point, we find ourselves phasing into one of the unquestionably more unique constructs upon the album, the “synthundated” (synth + inundated) “Dissolve To Ashes“. This is a number where electronics are utilized to their maximum yield, but first beginning as a riveting, effervescent embellishment. Ever so slightly, their presence a sedating element as they further unfurl, soon joined by equally ethereal vocals working in unison to entrance the listener. Quite Deftones-like for a moment, another component finding its way in, a guitar riff in tremolo mode breaks the sonic surface and ripples outwardly like a subtle cue to engage the aggression. A somniferously mesmerizing output of calming audio will ultimately acclimate all into “Altering Light“, beckoning in steps as its emanations envelope all we know. Yes, inward, inward, ever deeper into the haze of shoegaze and ambient effusion taking place, washing over us until it isn’t anymore. That happens at a point where there is an obvious turn in musical direction, a hard jerk of the steering wheel that sends everything crashing into densely abject doom. Totaled by this barrage of gritty, muddied sludge now striking us down, dashing any levity and determined to leave us groveling, all hope does seem lost. Yet, a slight reprise of the song’s tamer, more stable output from its earlier start is reapplied and remains until the song and record ultimately reach their cessation. With the arrival of the ending, a stark realization has crept its way into our being and now dwells within us. It awakens us to the first official release from SÂVER, ‘They Came With Sunlight‘, is without that very thing referenced… sunlight. There is no light here! This is bleak, ominously blackened and foreboding, full of sinister and disquieting contents. This is a threatening record, an injurious journey where the only illumination comes when your soul grows enlightened to the dire and lasting dangers of this musical manifestation. Stream ‘They Came With Sunlight‘ in this review or find further streaming and purchase options at Bandcamp HERE.